No introduction to the plant is needed for anyone with the slightest experience of nature and herbs. The name Jaanitee, “St John’s tea“, says that the plant can be picked for tea at Midsummer (St John’s Day). 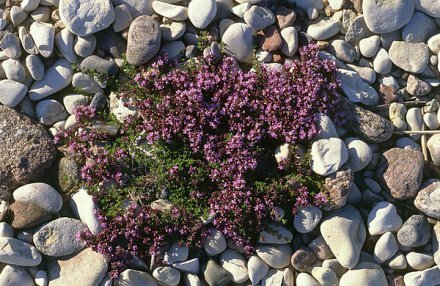 But experience shows that the flowering green tips of the stems of the breckland thyme or wild thyme can’t really be picked successfully until July; at Midsummer the first flowers usually just begin to open. When does the tea (1 teaspoonful to a glass of water) help? Against all ills in connection with colds: lowers fevers, eases influenza symptoms, acts as a cough medicine; is used for indigestion, liver troubles and inflammations. People of old called the plant “evil eye herb“, it was believed to ward off even the evil eye.